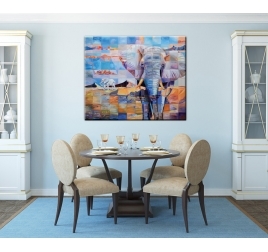 The famous pachyderm in a unique collection of elephant canvases ! In black and white, design, watercolours, our animal canvases show African elephants to give your interior a trendy touch. With its trunk and large ears, this unique and very gentle animal will bring a contemporary and deco touch to your interior. 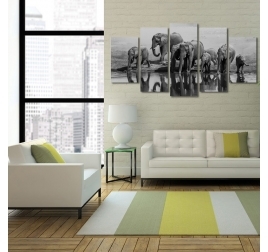 Those elephant canvases are ideal for a long corridor or a child’s bedroom decoration. 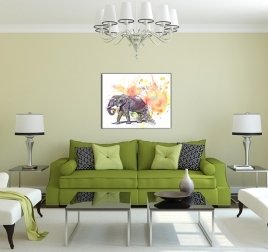 Splendid modern and colorful art print of a walking elephant. This decorative nature art print is 60 x 80 cm (23.62 x 31.50 po). Free delivery within 48/72 hours in metropolitan France for this contemporary art print. Each modern animal art print is treated to withstand UV and moisture. A beautiful printed canvas of elephants at the edge of the water. This nature canvas print is perfect for a large white wall for your home. The dimensions of this decorative canvas are 150 cm x 80 cm (30x50x2pcs; 30x70x2pcs; 30x80x1pc) Worldwide shipping for this animal canvas print with protection carton. With its primary colors and original drawing, this decorative art print is a unique piece. 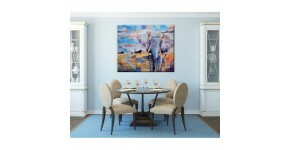 This modern art print is 100 x 80 cm (39.37 x 31.50 po). Free delivery within 48/72 hours in metropolitan France for this contemporary art print. Each modern art print is treated to withstand UV and moisture.